Susie Swan is hand made in the finest white cuddly soft plush and wears the famous Steiff Button in Ear and carries the yellow ear tag. The adorable 20 cm tall Susie swan is a true princess made of incredibly soft white plush fabric. 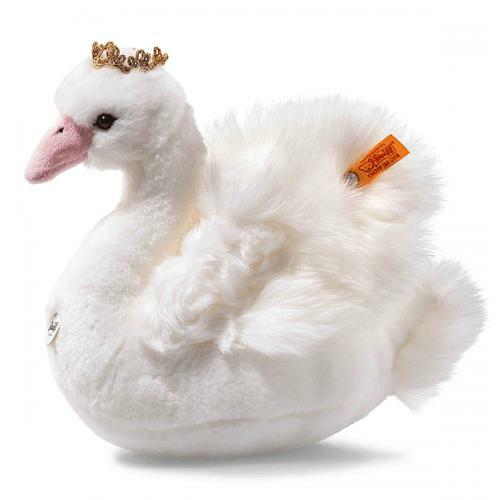 Susie swan features long plush wings with a gentle wave and a pink beak, which work together to make her a truly stunning beauty. A small golden crown sits atop her head. The corners of her eyes and her nostrils have been cleverly painted on in black. Susie swan takes you on a magical adventure to wonderland.